Building electronic projects that interact with the physical world is good fun. But when devices that you've built start to talk to each other, things really start to get interesting. Through a series of simple projects, you'll learn how to get your creations to communicate with one another by forming networks of smart devices that carry on conversations with you and your environment. Whether you need to plug some sensors in your home to the Internet or create a device that can interact wirelessly with other creations, Making Things Talk explains exactly what you need. 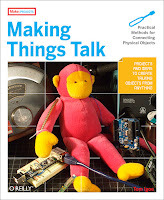 This book is perfect for people with little technical training but a lot of interest. Maybe you're a science teacher who wants to show students how to monitor weather conditions at several locations at once, or a sculptor who wants to stage a room of choreographed mechanical sculptures. 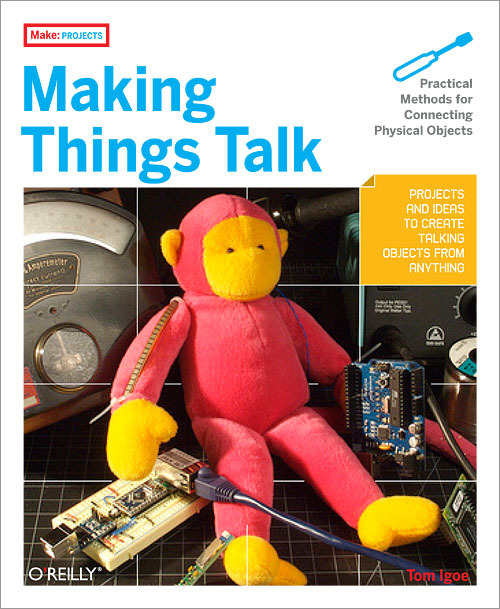 Making Things Talk demonstrates that once you figure out how objects communicate -- whether they're microcontroller-powered devices, email programs, or networked databases -- you can get them to interact. 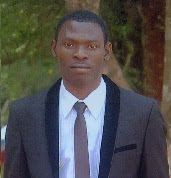 Set up communication between microcontrollers, personal computers, and web servers using three easy-to-program, open source environments: Arduino/Wiring, Processing, and PHP. With a little electronics know-how, basic (not necessarily in BASIC) programming skills, a couple of inexpensive microcontroller kits and some network modules to make them communicate using Ethernet, ZigBee, and Bluetooth, you can get started on these projects right away. With Making Things Talk, the possibilities are practically endless.